When it comes to make up I'm always changing what I wear and how I wear it. Sometimes I'm all about the minimal, other times I wouldn't leave the house without lashings of mascara and a bold cat eye. And this is no different from how I am with foundation. I've been through phases of only using BB cream to others where I've packed it on, I've played around with application with fingers, sponges, brushes, flat brushes, using powder, using mousses and creams. I've done it all and the latest phase is mixing. I simply can't seem to settle for one foundation, I have to have two! You can probably see that these foundations are vastly different shades. This happened by both having to buy online and also the season I bought/gifted them in. The Juice Beauty foundation was a birthday pressie (I'm a July baby) and I knew that in the following months I would be developing a lovely tan on my hollibobs! The Jane Iredale is actually a perfect real life skin tone match, however as my face has always for some unknown reason been paler than the rest of my body I like to go a little darker. Combined, the colour is awesome, when I get the balance just right it's neither too dark nor too light and I like that I have so much control over it. And I feel like I can switch up my look each day without any hassle. Again it's quite easy to see that these two foundations are very different in thickness and texture. The Jane Iredale Liquid Mineral foundation is super light and thin, giving it light but buildable coverage, while the Juicy Beauty Perfecting foundation is thick and full coverage. 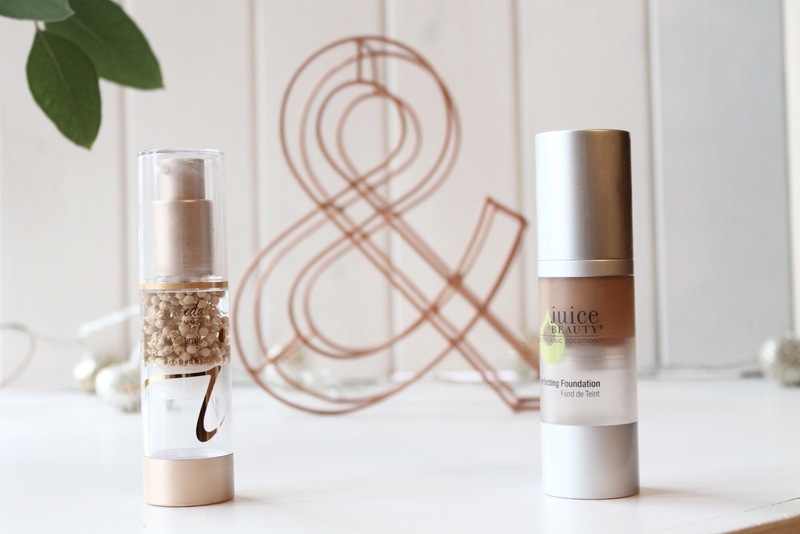 The Juice Beauty Perfecting foundation also dries mega fast so you have to work quickly, the Jane Iredale Liquid Minerals foundation takes a few seconds to settle and sink in. By combining I can create a consistency that is somewhere between the two, medium to heavy coverage depending on the amounts I mix and the dry time is a little more stable. Together they create my dream foundation and I haven't found any problem with spots or acne or oiliness or even dryness since I've been mixing these. Have you guys got favourite foundations you like to mix? I've been wanting to buy a more natural/green foundation for ages, but am always put off my buying online and not being able to test them. Sounds like you've found a perfect combo though, I may have to give it a try myself!